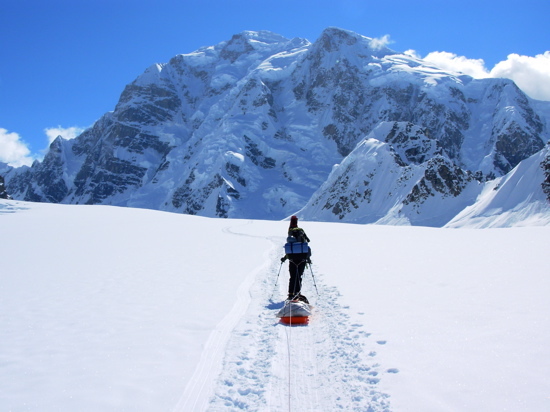 The flight from Talkeetna to Base Camp takes about an hour and covers 75 air miles as we leave the lush green of the Alaskan Tundra and enter the granite and ice-filled gorges of the Alaska Range. 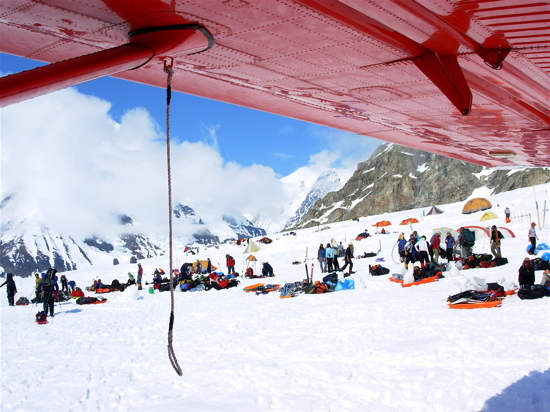 Our approach flight usually goes up either the Ruth Glacier and over South Hunter Pass and into the Base Camp landing strip, or directly up the Kahiltna Glacier from its toe, giving climbers the opportunity to look down on the world's longest glacier (43+ miles from head to terminus). 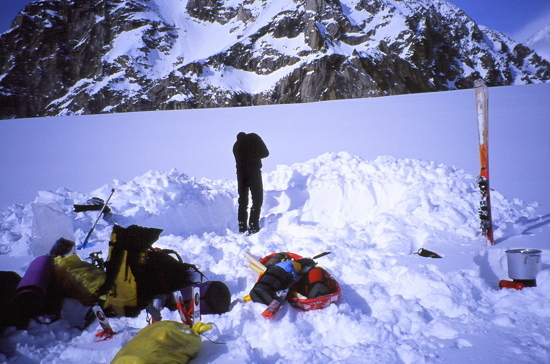 Base Camp is at 7200 feet on the Southeast Fork of the Kahiltna Glacier. 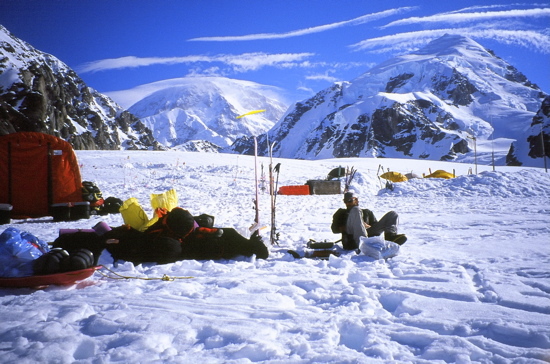 Base Camp is a hub of activity with climbers coming and going at almost all hours of the day. Because of the abundance of daylight in the spring, planes are able to fly early in the morning and late into the evening. 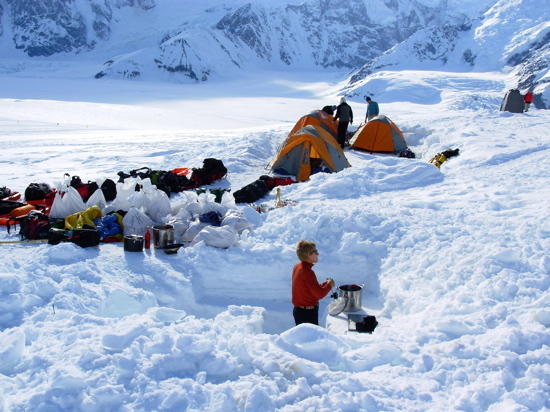 Most groups spend very little time at Base Camp and pitch tents hastily upon arrival, only to tear them down, pack and head out again late that night or early the next morning. We will make a cache of emergency food and items for our return in three weeks. 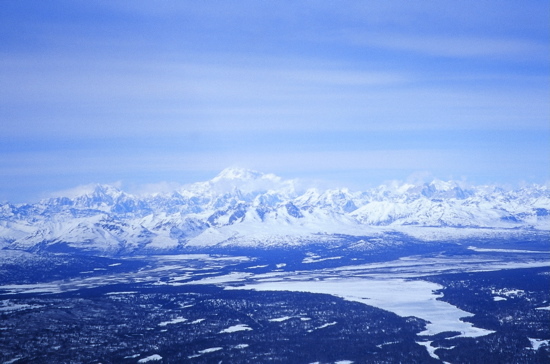 Views into the Alaska Range on appproach from Talkeetna. 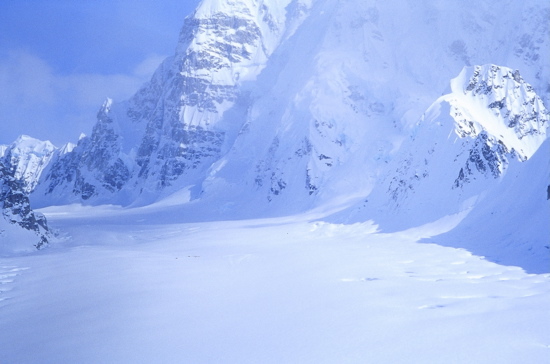 peaks and gorges begin to stand out from complex terrain surrounding them. 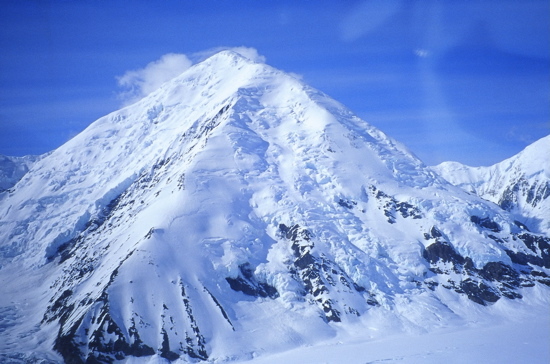 climbed as part of the Sultana Ridge Route on Mount Foraker. 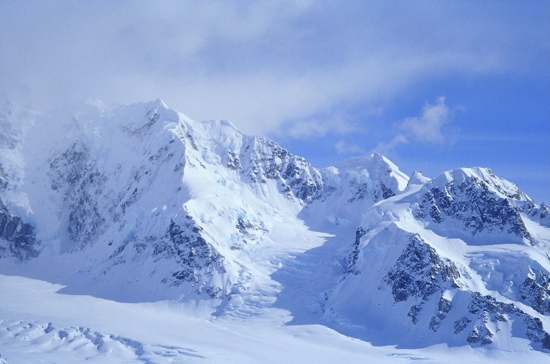 The lower West Ridge of Mount Hunter seen from the air just above Base Camp. 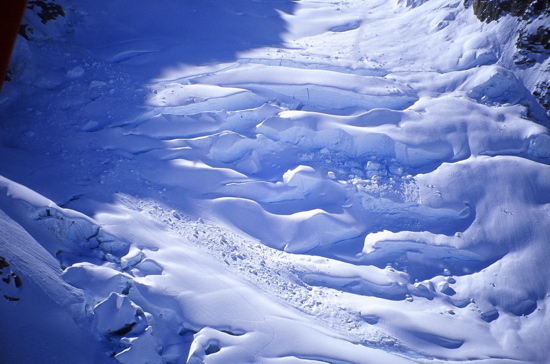 The Northwest Basin Icefall on Mount Hunter seen from the air just after crossing South Hunter Pass. 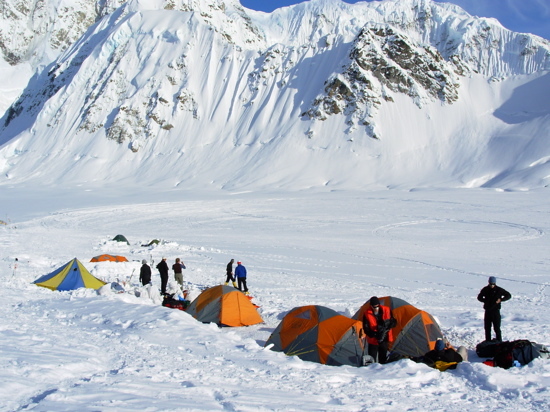 Base Camp tents on the Southest Fork of the Kahiltna Glacier below the North Face of Mount Hunter. 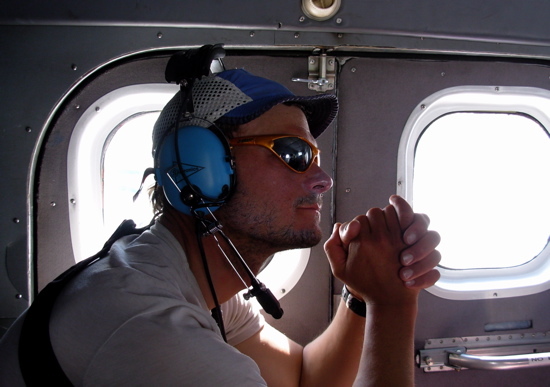 AAI guide Matt Anderson grateful for another safe landing. 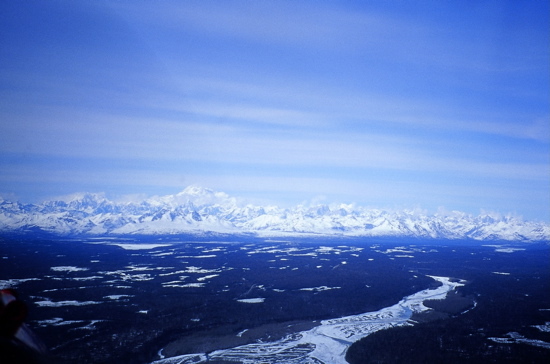 Our first view of the KIA (Kahiltna International Airport) and Denali Base Camp after landing. 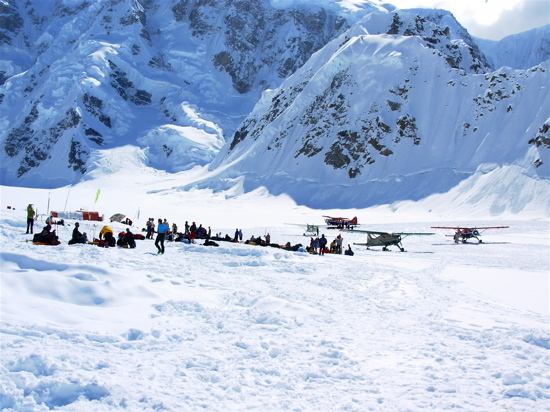 The head of the Kahiltna landing strip from Base Camp. 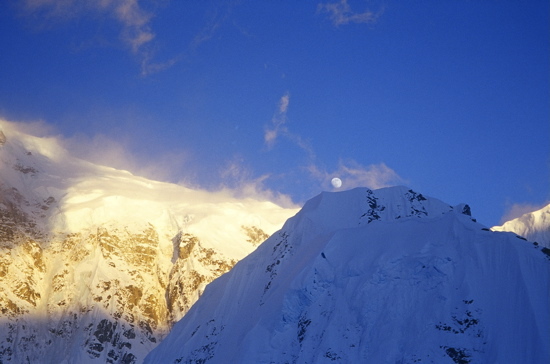 The North Face and North (Moonflower) Buttress of Mount Hunter from Base Camp. 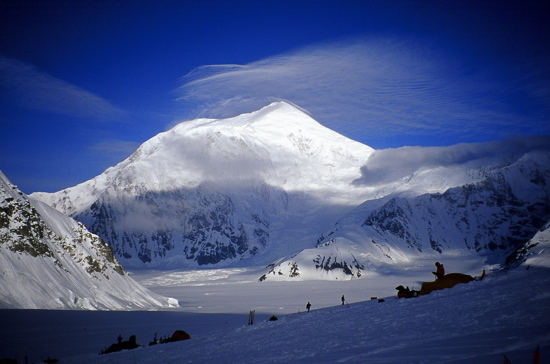 Mount Foraker from Base Camp. Camp. The South Face of Denali is in the clouds behind. Beginning the almost daily task of digging tent platforms. Cooktent life. 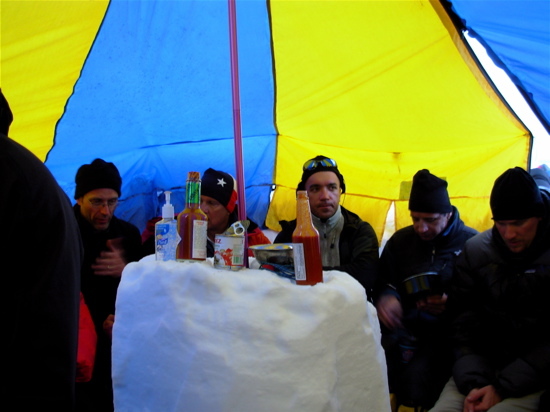 An AAI group is introduced to the joy of the cooktent at Base Camp. 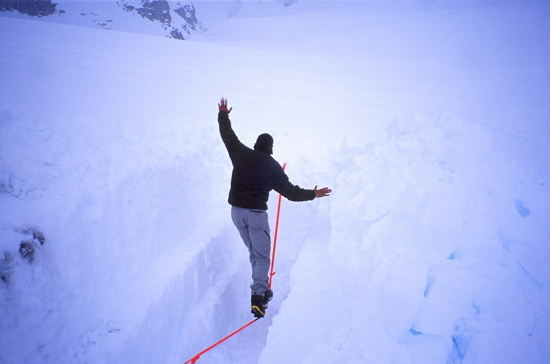 Walking the slack line at Base Camp during a stretch of bad weather. 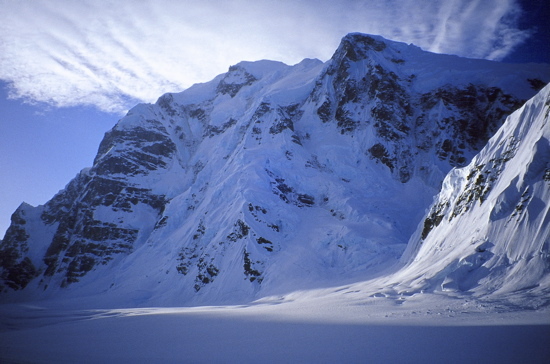 The lower West Ridge of Mount Hunter with the Landing Strip Ridge in the foreground. 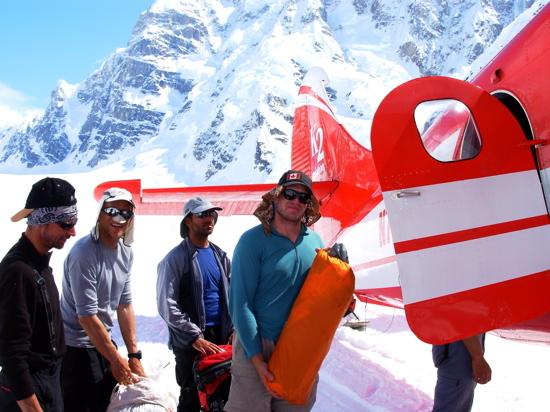 An AAI group at Base Camp after having arrived on the glacier that day. 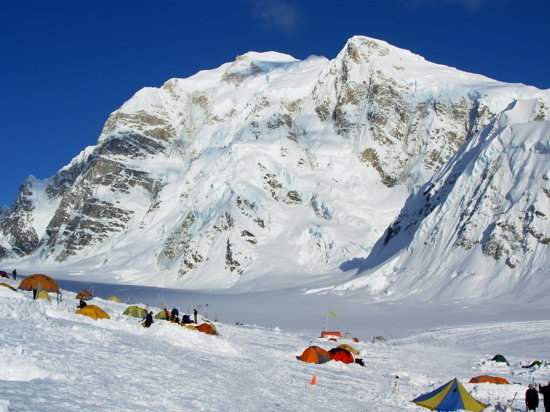 Climbers hastily pitch tents for the brief stay at Base Camp before heading onto Denali. Base Camp with Mount Hunter behind. 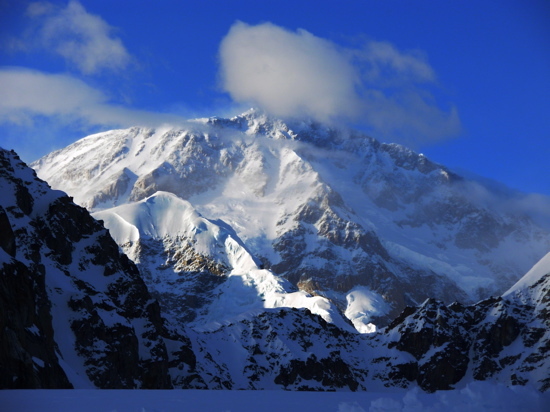 The South Face of Denali as seen from Base Camp with the Cassin Ridge highlighted in the evening light. 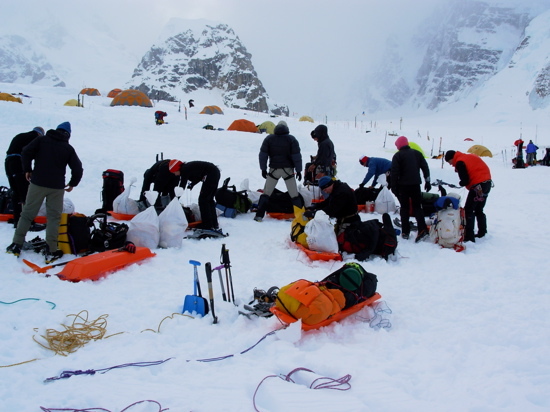 A group preparing to leave Base Camp and make a single carry to Camp 1. A rope team heading back up Heartbreak Hill towards Base Camp on their way home. 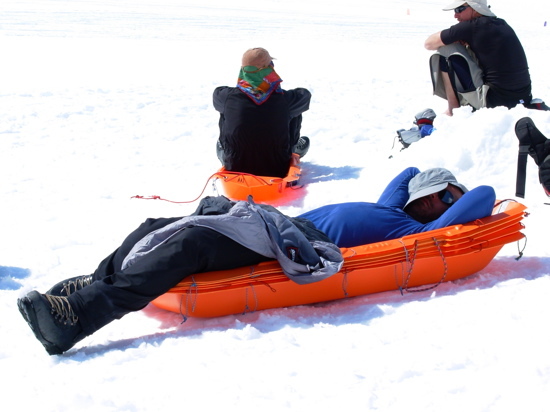 Climber Jason Ferns taking a load off after descending from 17,200 feet to Base Camp in one day. Loading the plane for the flight home. Want to talk with a guide?